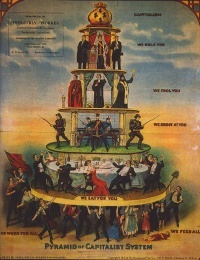 The Pyramid of Capitalist System is a common name of a 1911 American cartoon caricature critical of capitalism, closely based on a Russian flyer of c. 1900. The graphic focus is on social stratification by social class and economic inequality. It was published in the 1911 edition of Industrial Worker (The International Publishing Co., Cleveland, Ohio, USA), a newspaper of the Industrial Workers of the World, and attributed to "Nedeljkovich, Brasnich, & Kumarich". The picture shows a literal "social pyramid" or hierarchy, with the wealthy few on the top, and the impoverished masses at the bottom. Crowned with a money bag representing capitalism, the top layer, "we rule you", is occupied by the royalty and state leaders. Underneath them are the clergy ("we fool you"), followed by the military ("we shoot you"), and the bourgeoisie ("we eat for you"). The bottom of the pyramid is held by the workers ("we work for all... we feed all"). The work is based on an anonymous 1900 caricature of the Russian Empire hierarchy by the Union of Russian Socialists. The original picture showed workers supporting the pyramid on their backs, with the stanza: "The time will come when the people in their fury will straighten their bent backs and bring down the structure with one mighty push of their shoulders." Notable differences between the Russian 1900 original and the American 1911 derivative version include the replacement of the Russian Empire's black eagle with a money bag, the Russian tsar and tsarina with a more generic trio of figures (a monarch and state leaders in suits), two of the three Orthodox clergy with a Catholic cardinal and a Protestant minister, and the Russian Empire army with a more generic group of soldiers; the workers are no longer bent and no revolutionary stanza is present. On both pictures, a fallen child or child worker symbolizes the plight of the workers. Another shared element is a red flag raised amongst the workers, symbolizing the emergence of the socialist movement. The basic message of the image is the critique of the capitalist system, with its hierarchy of power and wealth. It also illustrates that the working class is supporting all others, and if it would withdraw their support from the system it could, literally, topple the existing social order. This type of criticism of capitalism is attributed to the French socialist Louis Blanc. The work has been described as "famous", "well-known and widely reproduced". A number of derivative works exist. Unless indicated otherwise, the text in this article is either based on Wikipedia article "Pyramid of Capitalist System" or another language Wikipedia page thereof used under the terms of the GNU Free Documentation License; or on original research by Jahsonic and friends. See Art and Popular Culture's copyright notice. This page was last modified 19:57, 2 October 2014.